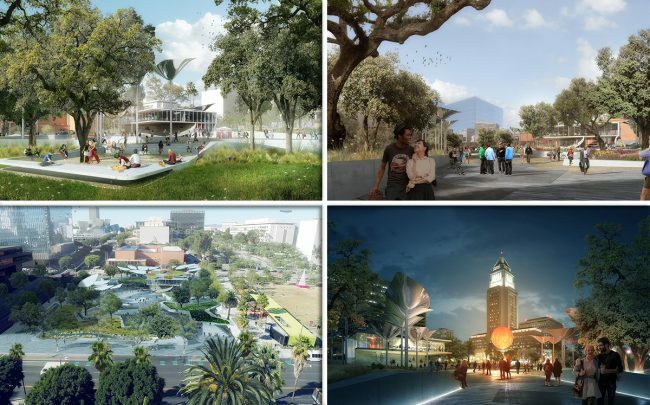 The multimillion-dollar major conversion of a state office building in downtown Los Angeles into a modern green park space has been put delayed. A new report to the Board of Recreation and Parks Commissioners reveals the cost of First and Broadway Park in Dow has surpassed the allotted budget by more than $10 million, putting construction plans on hold. Costs of construction rose to $28 million, exceeding the $17.2 million cap, Urbanize reported. So far, the Department of Recreation and Parks has been able to secure another $2.6 million. The money was pooled through the state’s Quimby Act, which developers contribute to in lieu of providing park space near their projects. The park project was designed by Studio MLA and OMA. It involves repurposing the site of a decaying government office building, which was badly damaged after an earthquake. Spanning nearly two acres, the park will include a “restaurant hub” with a beer garden and several shaded areas.